Wednesday, September 13th @ 7:30am Mikhail Mikhailov from FastenMaster will be at Hartnagel Building Supply with some light breakfast fair while demoing the following revolutionary tools by FastenMaster. Come on by get a quick bite to eat and try out their great tools! The newest fastener system for attaching trusses and rafters to top plates, the FrameFAST system consists of the FrameFAST structural wood screw and the FrameFAST tool. The FrameFAST screw is a code-compliant replacement screw for hurricane ties. The screw’s unique and superior design provides ultimate uplift and lateral resistance. FrameFast eliminates the need for ladders or scaffolding, pneumatic nail guns and hoses. It is up to 8 times faster than traditional framing methods. The FastenMaster PAMFast AutoFeed Screw System is designed for speed, precision and increased productivity. This system offers consistent drives without any bit grinding, cam-out or jamming on subfloor jobs. Paired with our fast-thread subfloor screws, you have a system designed for speed. Also great for pressure treated decks, composite decking, roof tile and drywall installation. 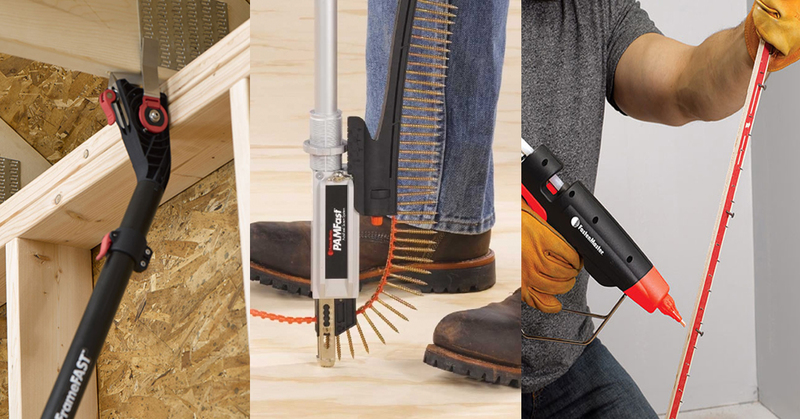 The HB220 is not your typical glue gun – it is a professional grade adhesive system designed for all day use in a variety of flooring installation, remodeling, and repair applications. This system is designed for hardwood flooring start and finish rows, carpet tack strip installation, interior wood trim and moldings, and much more! The HB220 Pro Applicator combines an adjustable high temperature range with a powerful 220 Watt heating element that keeps up with heavy all day usage. Get a FREE box of Flex Glue with the purchase of a Flex HB220 Remodel Glue Gun!